Hey everyone, it’s time for my March Hits & Misses. I have quite a few items this month as I’ve rediscovered quite a few items within my stash that I had forgotten about. Hourglass Ambient Lighting Palette Vol. 4 — This is my first Hourglass palette, but it most definitely won’t be my last for sure. As always with Hourglass products, this is top notch. There are six items within this palette; three powders, one bronzer and two blushes. All of which are absolutely beautiful, and look gorgeous on the skin. Usually with palettes like this there’s always at least one item I won’t use, but with this palette I’ll get use from all six products. The powders are gorgeous, and give a beautiful glow to the skin. As with all Hourglass items, this was expensive, but for me, it is worth it. It’s very much a luxury item, but if you’re happy to splash out, this is one product worth the money. I have quite a few items from Catrice this month, all from their Spring Summer collection. I have a full post with information and details on Catrice’s Spring Summer ’19 collection here and I will have another post soon with my thoughts on everything so keep an eye out for that. It’s Easy Tattoo Liner — This is a fabulous eyeliner and only €3.70 too!! It’s a complete steal at that price. It is incredibly easy to use, both for a single and thick liner and to create a nice, defined wing. It is very black and pigmented. It applies really nicely and it doesn’t drag on the eye, it just glides across my lash line. It’s long lasting without smudging, fading or flaking. If you see this, pick it up, you won’t regret it. Golden Dust Highlighter Drops — It will come of no surprise to you that I’m including this highlighter — it is absolutely stunning. It is a cream that dries to a powder finish and gives an absolutely beautiful golden glow. I adore cream products at this time of year, they give such a fresh look to the skin and this is no different. It applies so beautifully and without disturbing my base beneath. My base doesn’t break down, wear off, fade or look patchy with this over it. 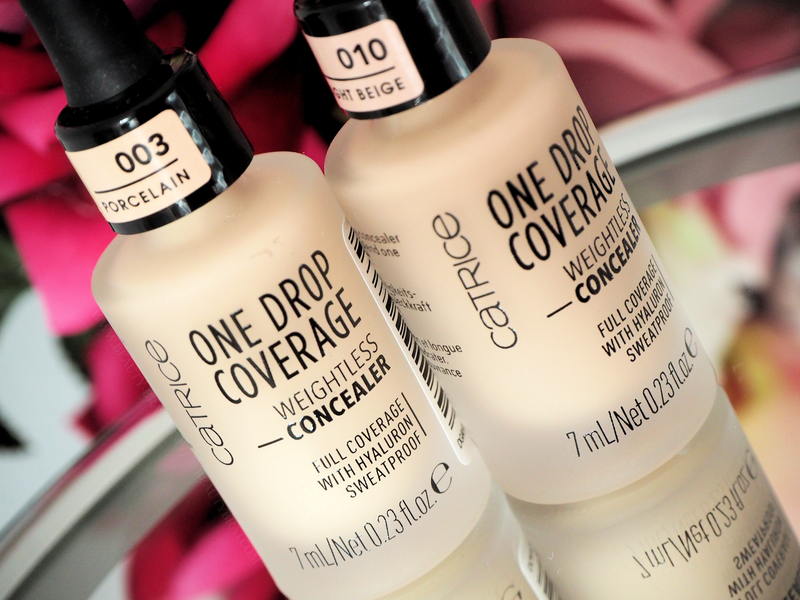 One Drop Coverage Weightless Concealer — This is another gem by Catrice. They are absolutely killing it at the moment with their new products. I’m a big fan of their Liquid Camouflage and when I was sent this to try, I fell in love with it just as much. It’s exactly as it says it is — one drop weightless concealer. This gives full coverage and has a semi-matte finish, but it does not feel or appear heavy on the skin. It doesn’t accentuate my fine lines really and creases less than some of my other concealers. The only downside is that it is only available in four shades. I use the shade ‘003 Porcelain’ which is a perfect colour for me. It brightens my under eye but without being start. Generation Plump & Shine Lip Gloss — This is a beautiful lipgloss. It’s pigmented but doesn’t saturate my lips in colour, which is my preference with glosses. It’s not sticky, gloopy or uncomfortable to wear. It has a nicely size doe-foot applicator that applies the right amount of product, but not too much or too little. This is gorgeous on it’s own or over a liner/lipstick. These glosses come in five shades and each shade is only €4.50. I will 100% be picking up more shades from the range. It’s one of the nicest glosses I have ever used. Tarte Amazonian Clay 12-Hour Blush in ‘Paaarty’ — I mentioned in a recent post that Tarte is a brand I haven’t had much luck with. A lot of what I’ve from them I haven’t liked or found to be mediocre, this blush is one that pleasantly surprised me, along with their ‘Rainforest of the Sea’ lipstick in ‘Beach Babe’ (review here). This is a gorgeous muted pink blush with a satin finish that is super pigmented so you need to use a very light hand. I adore the formula, finish and colour. I got this miniature from Sephora, but I would absolutely buy the full size once I’ve finished it. It’s $29 for the full size, but given how little you need each time, it worth it. Bobbi Brown Bronzing Powder in ‘Medium 2’ — If you’ve been following me for a while, you will know that Bobbi Brown is one of my favourite brands. I absolutley adore their products and this is no different. Although it is a bronzer, I prefer this particular shade as an eyeshadow because as you can see in the below swatch, it is much too dark as a bronzer on me (and I have tried to use it as a bronzer, too). This is a gorgeous product to use. It is quite pigmented which I don’t mind, but if I was using it as a bronzer, I would use a very light hand because of how pigmented it is. It’s a silky smooth powder that glides on and looks beautiful. I love this for a simple smokey brown eye. Just packed on all over my lid and blended through my crease, add mascara and liner and you are good to go. I got this mini size from Sephora, however I would consider purchasing a full size if there was one suitable for my skin tone. Laura Mercier Eye Art Artist’s Palette — I rediscovered this palette about six weeks ago after I had forgotten about it, and since resdiscovering it, I have been completely in love with it. There are twelve shades, a mixture of matte and shimmers, they range from warm to cool tones. I love this for day and night looks, it’s such a beautiful palette and the colour selection is gorgeous, especially if you love purple and plum eyeshadows. The shadows are very pigmented, so a light hand is needed. I will have a full review on this soon for you, so keep an eye out for that. Bioderma Photoderm Max Cream SPF50+ — I spoke about this previously in my July 2018 Hits & Misses (here) and I’m mentioning it again because frankly, it is amazing. A lot of SPF’s are sticky and tacky and my makeup doesn’t apply nicely or last well over them, but this one changes all that. It is extremely light on the skin, there is absolutely zero stickiness or tackiness, it dries to a velvet like finish. If you have ever used the Hourglass Veil Mineral primer and you are familiar with how that sets on the skin, well, this is similar. My makeup applies so nicely over this and wears well too. I have no issues whatsoever with my makeup applied over this. La Roche-Posay Toleriane Ultra Fluid Day & Night Creams — I rediscovered these items this month as I am trying to finish up some skincare items before purchasing new ones. I’d forgotten how great these are. They are very light and non-greasy, they absorb quickly and even under makeup, the day cream caused no issues with my makeup applying, blending or wearing throughout the day. Organic Shop Body Scultping Cream in Floral Dream — I am always applying hand cream and find that I go through tubes very quickly, so I prefer bigger tubs like this and I saw this in TK Maxx for €3 or something silly and decided to pick it up to use as a hand cream. Although it says ‘body scultping’ I pay no heed to that as I don’t think any creams, lotions or potions can really ‘scultpt’ your body. This is a very thick, mousse like cream. Although it is thick, it is not sticky, greasy or uncomfortable, it absorbs quickly. It has a gorgeous scent that is strong at first, but it dissipates once absorbed. That rounds up my Hits & Misses for this month. Have you tried any of the products mentioned? What did you think of them? Follow me on Bloglovin’, Instagram, Facebook, Pinterest and Twitter.